Elina is a single mother from Mpulula Village in Traditional Authority Msamala in Balaka District. Her home is almost 10 kilometers away from Balaka town. She discovered that she was HIV positive when she was pregnant but wasn’t ready to disclose her status to anyone. She did, however, register for the “tips and reminders” service from Chipatala cha pa Foni (CCPF), or “Health Center by Phone,” which provides important maternal and child health information via SMS. She followed the information she received from CCPF and called the hotline whenever she had a question or concern during her pregnancy. Elina delivered her baby girl, Miracle, on June 13, 2013 at Balaka District Hospital. When she delivered, she was given Bactrim for Miracle; Bactrim is an important medicine for preventing infection in HIV-exposed infants. But when Elina got home she was unsure of the correct dosage, giving her daughter two doses instead of one for several days. Elina thought to call the CCPF hotline to verify the dosage. After hearing her story, the hotline worker referred her to a nurse consultant who corrected her and gave her reassurance. She was very happy after talking to the nurse and decided to register her child with CCPF so that she could start receiving the tips and reminders messages for her baby. Since that time, Elina has been calling CCPF whenever she faces any challenge concerning Miracle or herself. 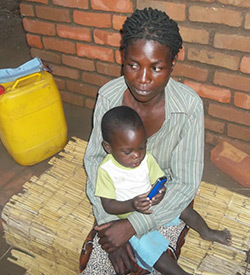 When Miracle was six months old, Elina called CCPF to ask what types of food she was supposed to give for supplementary feeding. She followed the advice she received from the hotline worker on proper nutritional requirements and food groups. She called CCPF again when Miracle had a cough lasting for more than two weeks and was not responding to the treatment she received from the hospital. The hotline worker advised her on household hygiene practices, and soon after following those suggestions, Miracle’s symptoms resolved. 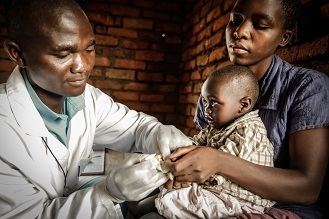 When Miracle turned one year old, Elina called again to report that Miracle’s most recent HIV test was negative. She said that messages she received from CCPF had helped her a lot, and have greatly contributed to the health of Miracle and herself. Elina is grateful to CCPF for assisting her before and after Miracle’s birth. She says that it is a great relief to have CCPF available to answer questions whenever she has them, assuring her that she is doing the right thing for Miracle, helping to decrease her fears and worries.